Donald Trump: Apply resources to stop the inflow of opioids into America. Hillary Clinton: $10B to prevent quiet epidemic of drug & alcohol addiction. Hillary Clinton: Provide every student an education in computer science. Barack Obama: 100,000 new science & math teachers over the next decade. Barack Obama: Educate to Innovate: new national STEM Master Teacher Corps. Mitt Romney: Higher spending rarely correlates with better results. Donald Trump: Focus on disease & clean water, not "climate change". Hillary Clinton: $60B to make US the clean energy superpower of 21st century. Hillary Clinton: We need nuclear power to meet climate challenge. Jill Stein: Climate change is humanity's greatest existential threat. Barack Obama: First-ever carbon pollution limits for new oil & coal plants. Barack Obama: $90B for clean energy; biggest investment in history. Barack Obama: All-of-the-above approach to reduce foreign dependence . Mitt Romney: No consensus on extent of global warming or human activity. Mitt Romney: $90B on green energy is better spent on private research. Mitt Romney: With Canada & Mexico,2020 North American energy independence. Mitt Romney: Use all energy sources, without stifling energy production. Mitt Romney: Feds take 307 days to permit oil drilling; states take 10. Donald Trump: Regulations by unelected officials reward special interests. Hillary Clinton: Conserving biodiversity is essential to our quality of life. Hillary Clinton: Establish an American Parks Trust Fund. Jill Stein: Ban neonicotinoid pesticides that threaten pollinators. Jill Stein: Apply federal Superfund program to polluted drinking water. Barack Obama: First reform of food safety laws in more than 70 years. Barack Obama: Bolster the use of organic farming methods. Barack Obama: National clean water framework: protect America's waters. Barack Obama: Establish Great Lakes Restoration and National Ocean Policy. Barack Obama: Monitor health of fisheries & establish "pollution diet". Mitt Romney: FDA should collaborate with businesses they monitor. Mitt Romney: Clean Air & Water Acts are significantly out of date. Mitt Romney: Welcome input from fisherman to help protect fisheries. Mitt Romney: Mercury rule spends $10B to reduce $6M in pollution. Barack Obama: Prepare for global pandemics with global partners. Barack Obama: Develop alternatives to importing rare earths from China. Mitt Romney: Regulatory cap: Repeal outdated regulations to make new ones. Donald Trump: Educate public on value of comprehensive vaccinations. Donald Trump: Lack of mental healthcare is greatest tragedy today. Donald Trump: Focus on greatest bang for the buck, not public health. Hillary Clinton: Early diagnosis and intervention for mental illness. Jill Stein: Vaccines are a foundation to a strong public health system. Jill Stein: Early diagnosis and intervention for mental illness. Barack Obama: Too many Americans skip preventive care due to cost. Mitt Romney: ObamaCare drives medical device jobs overseas. Mitt Romney: Develop countermeasures for global pandemics. Mitt Romney: Preventive vaccines require robust R&D enterprises. Donald Trump: Let college grads stay but H-1B only if jobs can't be filled. Jill Stein: H1-B Visa program is ok, but help global economy abroad. Donald Trump: All humankind benefits from reaching into the stars. Donald Trump: Make desalinization affordable; rebuild water infrastructure. Donald Trump: Proportional response to eliminate cyberattacks. Donald Trump: Encourage innovation in the areas of space exploration. Hillary Clinton: Inspirational, achievable, and affordable space initiatives. Hillary Clinton: Underinvestment in water infrastructure impacts minorities. Hillary Clinton: Respond to cyberattacks economically & militarily. Hillary Clinton: Collaborative consortia for technology transfer of R&D. Hillary Clinton: 1% of federal budget is underinvesting in basic research. Jill Stein: Demilitarize outer space; don't privatize outer space. Jill Stein: Negotiate an international treaty banning cyberwarfare. Jill Stein: Make science policy more democratic & responsive to citizens. Barack Obama: Double funding for key research agencies. Barack Obama: Invest 3% of GDP in public & private R&D. Barack Obama: Free and open Internet is essential to modern economy. Barack Obama: Make science policy decisions based on facts, not ideology. Barack Obama: Send humans to Asteroids by 2025 & Mars by 2030s. Mitt Romney: Innovation is the key to economic growth and job creation. Mitt Romney: Government has no role in "managing" the Internet. Mitt Romney: Net Neutrality imposes government as a central gatekeeper. Mitt Romney: Space crucial to national security & international standing. Mitt Romney: Rare earth scarcity driven by regulation, not economics. 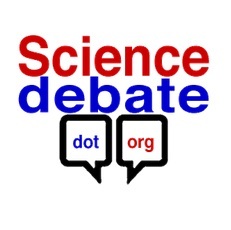 The above quotations are from 20 Questions on science from ScienceDebate.org. to the right are "surveys"